Convicted 24.02.1916 of failing to close against soldiers. At the Licensing Sessions held Tuesday 23rd August 1870, William Lovick, having taken over the hostelry at the corner of the block of buildings recently erected on Chapman's Fields, applied for a full licence. Of good character he had previously run the ALE & PORTER STORES in Prince of Wales Road and was supported by a testimonial from the churchwardens and overseers of the parish. It was stated that it would simply be a granting of a licence to a new district, such was the number of houses built in the vicinity. Granted. First confirmed sighting as the VICTORY in 1875. Closed and boarded up July 1997. Modernised from three rooms to two in 1973. One bar, modern fittings, two glazed tile fireplaces. 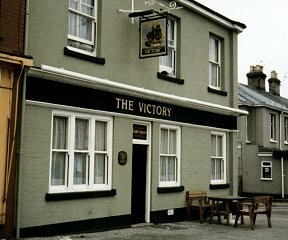 Two windows are engraved with a picture of the Victory.